This wildlife reserve is situated in the extreme south-west of Nepal. The name of the park is derived from the largest of these grasslands which is known as Sukla Phanta. The park area is 155 sq kms. and would be 305 sq kms. after the completion of its extension. Sukla Phanta's grassland is one of the last remaining habitat for such threatened animals as the hispid hare and the pygmy hog. Besides these, Sukla Phanta is the stronghold for another endangered animal, the barasingha, or swamp deer.Other wildlife of the park included spotted deer, also seen in large numbers, hog deer, nilgai, wild dog, jackal, porcupine and otter. The park and the adjoining for-est is the territory of small number of tigers which because of open terrain, are not uncommon to sight on the prowl. 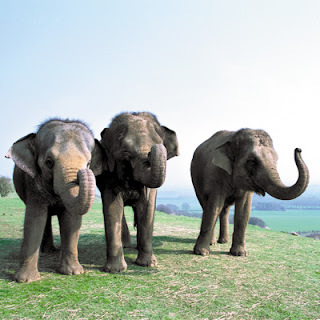 Wild elephants have also been sighted in the park.A stop at the Rani Tal is a must. This small lake attracts birds and animals alike. Herons, ducks, storks, kingfishers and egrets vie for food and swamp deer wallow at the edges. From a nearby machan one can watch while thousands of water fowl mingle on the lake surface while it is not uncommon to see hundreds of swamp deer grazing at the water-edge in the evening light. The experience is unique. Other ways to view wildlife in the park is by driving in landrovers near the lake and river and on nature walks with trained tracker. Predominant sal (Shorea robusta) forest is associated with asna (Terminalia alata), semal (Bombaxceiba), and karma (Adina Cordifolia). Khair, (Acacia catechu) and sissoo (Dolbergia sisso) forest is found along the river side. The main grass species of the phantas are Imperata cylindrica and Saccharum heteropogon which are extensively used by the local people for thatching. 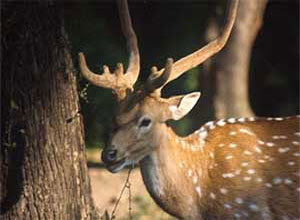 The reserve provides prime habitat for swamp deer (Cervus duvauceli). An estimated population of 200 0 is found in the reserve. Other wild animals in the reserve are wild elephant (Elephas maximus), tiger (Panthera tigris), hispid hare (Caprolagus hispidus), blue bull (Boselaphus tragocamelus), leopard (Panthera pardus), chital (Zxis axis), hog deer (Zxis porcinus) and wild boar (Sus scrofa). A total 268 species of birds has been recorded in the reserve. Many grassland birds along with the rare Bengal florican can be seen in the phantas. Marsh mugger crocodile, Indian python, monitor lizard and snakes like cobra, krait and rat snake have been recorded in the reserve.